By Peter Anderson 34 Comments - The content of this website often contains affiliate links and I may be compensated if you buy through those links (at no cost to you!). Learn more about how we make money. Last edited November 20, 2017 . Over the last few weeks I've been soliciting tips, tricks and best practices from successful bloggers – asking them what their best advice is when it comes to making money with a blog. Many of them were kind enough to respond with some great answers. So here they are! Let's jump right in and get advice from successful bloggers. The key to creating a successful blog has to do with establishing the right goals. When you start, you shouldn't have any revenue related goals and you should be trying to hit traffic, comment, and email goals. How many people are visiting? How many are returning? How many subscribers? How many comments? Those are the important metrics when you first start. When you have only a handful of visitors, don't try to make money off them! Try to build a relationship so that they will contribute to the growth of your site through comments, email, and the flow of ideas. When you focus on money, that's all you'll see. You will be discouraged when it earns $1 that first month and you'll likely abandon it because there is no money. It took six months from the placement of the first ad on Consumerism Commentary until I earned enough to receive the first check. But I prefer to look at this differently. I've been creating online communities since 1990 and the first check I received was in 2004. Even though I'm earning six figures now, it took a long time to get there. I've seen many people start their projects with the goal of making money first, while the goal of creating something useful or wonderful remains farther down on the list if it makes the list of goals at all. This is the wrong approach and will often lead to frustration and abandonment. Audio technicians talk about “sound vs. noise.” A quality signal requires a high signal-to-noise ratio. Please don't start a blog with the sole purpose of earning money. The internet is already full of mediocre content, designed in bulk, with the hopes of attracting advertising revenue. Any more of the same will only add to the noise, reducing the usefulness of the internet as a whole. Start with the idea of developing excellent content that people will want to read and once you are on the path to success, consider how you will bring revenue into the picture. Write good content, write lots of it, and write for a long, long time. Before you put up your first ad, consider why you want to monetize your blog. Are you looking for a second income stream? Are you hoping to use the money to pay off debt? Or are you simply looking for some extra “ice cream” money each month? The answer to this question will help guide your advertising strategy, as someone hoping to use the earnings from a blog to pay down debt may be willing to be more aggressive (more ads, more obvious placement) than someone just out to make a few extra bucks while building a large audience. If blogging to make money is serious business to you, then treat it like a business. Take some time to define your potential audience, what that audience may be interested in buying from you, and which advertisers may be interested in running ads on your site. And don’t just think linearly – there are many peripheral topics that might draw attention from advertisers. For instance, I write mostly about personal finances, but have had interest from advertisers in real estate, careers, taxes, even the auto industry, because I touch on these topics as part of a larger personal finance discussion. Just like many bloggers Adsense is the biggest payer for me. I found that by running detailed tests and comparing results of different ad shapes, colors, and placements you can dramatically increase your earnings. In fact, in my article I wrote about how I make money with my blog, I explained the 10 things I did to increase my Adsense earnings by $1500 in 3 months. I had plenty of traffic to make money with Adsense, but I was just doing all the wrong things. I continually test my Adsense ads and there is always room to improve – test, test, and then test again. On another note, it is critically important to avoid time-wasters and focus on your goals. If you goal is to make money by blogging, then you shouldn't focus all your energy and time on the things that aren't directly taking you toward your goals. For me, I was getting stressed out when I wasn't getting enough comments or wanted to have more subscribers. Believe it or not, there is very little correlation between these metrics and the amount you make from your blog. The key to making money with blogs is targeted networking. Instead of trying to network with every blogger out there, develop a game plan to start with the folks with the most influence. You can compile your own list of people to target, or use this list of top personal finance blogs as a guide. Think of it as the Pareto Principle for blog networking. Go down your list and start offering each influential blogger something of value. Offer to do a guest post, run a project for them, feature their best posts on your blog, etc. For example, Wise Bread has a pretty nifty guest posting program that gets bloggers a lot of exposure. Everyone knows networking will increase traffic, but how does it directly help you make money? Top bloggers get advertising offers all the time. They can't handle all the offers they receive from advertisers, so once in a while they have to refer the opportunities to other bloggers. If you have a great working relationship with these top bloggers, they will feel comfortable referring you to their advertisers. If several top bloggers frequently mention your blog to top ad agencies, the agencies will bookmark you as a go-to blog for their top clients. Remember back in high school when your teachers or guidance counselors told you to “do what you love and the money will follow?” Well, it doesn't always work that way. I know plenty of people who have hobbies that are time and money sinks. Thankfully, starting a blog can be one of those hobbies that pays for itself and can even be very profitable. 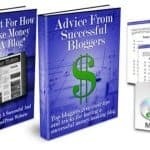 There are dozens of ways to make money from blogging, and I don't want to focus on listing each one – Pete has many of those topics covered. What I want to talk about is passion. Write about your passions and people will appreciate your energy and enthusiasm. And hopefully they will link to your blog or share your site with others by e-mailing your links, or by sharing your site via FaceBook, Twitter, or other social media outlets. Why is this important? Because the root of making money online comes from one thing: visitors. Without passion and enthusiasm it will be difficult to maintain the consistent high quality production that is necessary to bring in a steady stream of traffic. The final bits of advice I have are these: blogging is not a get rich quick endeavor. It takes time, patience, hard work, quality content, networking, skill, and sometimes a bit of luck. Basically, there are no shortcuts. But if you are willing to put in the work you have a chance at making money online. Provide a service or value for your readers and they will appreciate your site. Help people achieve their goals and they will appreciate it even more. When it comes to making money online through blogging, diversification is key. If a large part of your blogging income comes from one source, you need to look into other revenue streams to spread out the load and increase your bottom line. I see a lot of people start with Adsense and stop there…or dabble in affiliate marketing and then that's it. They continually beat into the ground the same methods forgetting to look at other outlets like newsletters, direct advertising, having your own products etc. Ideally, you want to have a lot of revenue streams so that…should the worst happen and one of those goes away…you have other options that pick up the slack. If you really want to make money blogging, you do not have to have 100k+ subscribers and “problogging” elite status. Making money through blogging is about having an attentive, targeted audience that you are providing consistent value to on a regular basis. If you focus on accomplishing that…add in some smart monetization methods and business decisions that fit that audience…it really all falls into place. Just remember…testing is key and what works for one successful blogger might not work for your blog. Keep testing until you find a formula that works and then start testing again. Content: If you want a quality flow of traffic, you need to create quality content. For me, that means staying true to the nature of my own blog, remaining true to my “own voice”, and focusing on those articles that speak to my audience. Community: If you want to grow your traffic, and thus create more opportunities to generate income, you need to engage in community. Find other bloggers who are in your niche, connect with them, network when appropriate, and support their efforts. A rising tide definitely lifts all ships. Consistency: If you want to move beyond traffic “spurts” and have steadily increasing traffic numbers, keep posting! I have found that one or two posts per day, for a site my size, result in increased traffic. Anything less, and my numbers decrease. Anything more, and readers are overwhelmed, and numbers remain relatively the same. Each site will have its own “type” of reader, and each blogger should post at a frequency equal to the fervency of his / her audience. Much has been said about creating a blog on a topic you love because you can then write interesting content, but making money from blogging is so much more than that. Only an owner who is obsessed with changes and measuring results can turn a mediocre site into a money making machine. Great content will attract traffic, but making money as a result of it is another arena all together. Be genuinely interested in your topic, but be passionate about trying to make record breaking profits every single day if you truly want to maximize your monetary gains from your time spent. Set up an email service to email your subscribers. Feedburner is great, but Aweber takes the cake. Why? Simple: With Feedburner, you can only send out emails every time you write a blog post, and those emails can’t contain any other information other than what is in your blog post. I find my email subscribers are more “sticky” because they are getting information that is not available publicly on my blog. They are also more likely to purchase products I recommend than RSS subscribers. An email list in Aweber is an asset; you can promote products using only your email list. Typically, depending on the product and the way you promote it, you can expect 0.5-3% of your list subscribers to buy the product. Considering many products have decent affiliate commissions, this is a substantial income stream. As big as the internet is, when you first start blogging you feel completely alone. Take the time and do some research on how to truly get a blog off the ground. Subscribe to some of the big time blogs in your niche and start taking notes on how they do it. Start conversing with other bloggers and when you are brave enough start commenting on their blogs. Share some link love here and there (by linking out) and really focus on writing stuff that people actually like to read (work in process for me, too). Keep at it and you'll instantly make some great contacts and soon have a network more reliable than Verizon. Be consistent with your writing (as best you can) and prove to your readers and your niche that you are for real and you're here to stay. Participate in carnivals, chat via Twitter, and soon you'll have hundreds of new people visiting your blog daily. It takes time, so don't get discouraged. It was well over 6 months before I had over 100 people visit my site in one day and I was pumped! Now that's a snap. I think there are four pillars to a great money-making blog. They are (listed in order of importance): (1) Write Great Content. There is absolutely no substitute for well-written, interesting, unique content. On our home improvement blog, we think great content is a combination of “how-to” articles, tool and service reviews, home improvement news, and personal experiences. (2) Network, Network, Network! You can write the best content in the world, but if you aren't good at getting the word out about yourself, you'll have no success. Introduce yourself to others. Let them know about your content. Ask for links to your content from relevant, related sites and be willing to give links to others' good writing. (3) Build an Attractive Site. Invest in your site design. A well-designed site will help attract both readers and advertisers. This isn't as important when you are a smaller site, but can really help boost your reputation and presence as you grow. (4) Monetize. Figure out what advertisers best convert with your content. There's a reason that financial programs on television frequently have finance-related ads. It's because people watching financial shows are, on average, more interested in buying financial products. Consider using a mix of PPC, affiliate, and paid-placement advertising on your site. If you really do these four things and you persevere, you will make money online. For all of us on One Project Closer, the key has been to steadily work on the site as we have time and to view it as an evolving hobby business. One question we frequently receive is how to get started with the monetization process. I think that Adsense is the best service for new bloggers. It's relatively simple to set up and easy to use. There's a wealth of information online about the best way to use Adsense on a site, so it's one of the simplest methods to get started with monetization. If you want to make money from your blog, nothing beats eyeballs. In today's busy world, having people's attention is a very valuable commodity. To get that attention you typically need two things: Content and Promotion. I always say that content is King, but promotion is Queen. I can't help you improve your content for your blog, but I can give you a couple of tips on promoting it. Perhaps the biggest key to my success was joining a blogging network, The Money Writers. Me and 10 other personal finance bloggers bounce ideas off each other. Also their success translates in part to my success as they promote my content (and I promote theirs). Beyond all those obvious benefits, there's the mental aspect as well. I think each of The Money Writers at one point or another said that they'd likely have quit blogging a long time if not for the blogging network. We are our own support group. There are endless ways to make money blogging. Some bloggers find success displaying ads while others make big bucks selling their own products. When I started blogging at Squawkfox in January 2008, I never imagined I would land a book deal with a major publisher in just one year. But I did. My first book, 397 Ways To Save Money hit the Amazon Canada Top 100 Bestsellers List within weeks, and I have blogging to thank for my new found income. If you've ever wanted to turn your blog into a book, here are a few smart tactics you can employ to help you land a deal. Use your own voice. Don't be afraid to be yourself and write posts your way. Authors share stories with others using their unique style and are not afraid to ruffle a few feathers with their voice. Forget about blogging schedules, post lengths, and SEO keywords by focusing on what makes you tick and writing until your story is done. By going beyond the usual, finding what makes you unique, and showing your skills, your blog may just become a publisher's paradise. Tell a story. Did a funny thing happen to you on the way to the post office? Then share it! Readers love a good story they can relate too, so find the human interest element and get blogging. In The Best Things in Life are Free I shared a very short story about a very long bike ride, and my readers responded. Write timeless content. Forget about chasing the latest fad and stick to topics that stand the test of time. Sure, the odd up-to-date news flash is fun, but publishers want books that can be sold for years, not months. Aim for eternity when you post, and your blog will never go stale. Blogging for bucks is not always easy. But writing with honesty and a passion for your subject may just improve your blog and help you get noticed by a publisher. Have patience. Many people think they can start a blog and start making 4 figures the next month, but let me tell you – it isn't going to happen. So have patience and work at it for at least 12 months before expecting to see any major returns. In addition to patience, content is king. You see this mantra almost everywhere and in every “How To Blog” book, and it is the absolute truth. Without content, you don't have anything. Don't just regurgitate what everyone else has already said – be original, be ruthless, be honest, stick to your opinions. I would rather read post after post with an opinion I disagree with than read post after post without heart, passion, or opinion. Don't bore your readesr, and your readers will always come back for more. Don't write for search engines, write for people. Too many bloggers only write to get good rankings in the search engines, but to be honest – I don't have much interest in reading their stuff. You need to pay attention to the keywords and content of your posts, but don't just write mechanically so you can rank for certain words while ignoring that humans want to read your stuff. That's your audience; not some bot over at Google. It's been quite a ride, blogging for money. Month to month income is different, sometimes up and sometimes down, and once in a while you have a very bad month. But I wouldn't trade it for the world. Focus on what you are best at. For me, that meant devoting my time early on to writing finance and tax articles about topics that I love. I had my husband help with the technical work so that I was spending my time in the right places. Instead of spending hours trying to figure out how to make modifications to my site, I could focus on writing a tax article that many people need help with like, How Much Money Do I Have to Make to File Taxes? Picking topics with a broad audience also helps. While taxes aren't that exciting for most people, they are something everyone has to deal with. The result is that you have information that people are looking for. But you have to make sure you are interested in the topic. I couldn't write about taxes if I didn't love them! Have you started your own successful site? What tips would you give to aspiring bloggers who want to make money with their blog? If you're just starting your blog, tell us your thoughts on the advice given today – does it give you a better idea of what to expect? What other questions do you have that you would like to see answered? Leave us a note in the comments! 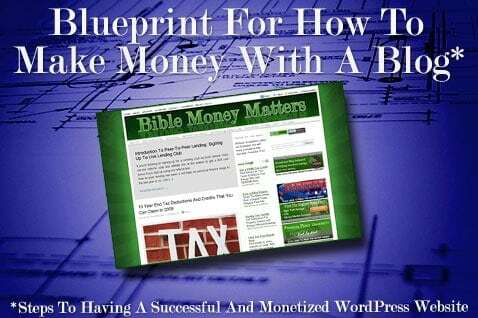 This post is an addendum to the Blueprint For How To Make Money With A Blog e-book. If you're looking for more tips on how to make money with a blog, please check it out! Sign up for our email newsletter to get a nicely formatted ebook version of this post! Last Edited: 20th November 2017 The content of biblemoneymatters.com is for general information purposes only and does not constitute professional advice. Visitors to biblemoneymatters.com should not act upon the content or information without first seeking appropriate professional advice. In accordance with the latest FTC guidelines, we declare that we have a financial relationship with every company mentioned on this site. Another great blogging article Pete! Great to hear the opinons of successful bloggers about what it takes. Really enjoyed the series! You’ve done it again! Thanks to all the contributors as well who shared the information! I got a lot out of it. One question I do have is dealing with negative comments. Do you delete? Ignore? or respond? It depends on if the commenter has a valid point. If they’re just engaging in ad hominem attacks, I delete right away. If they’re making a point that I don’t agree with but they’re generally nice about it, I allow it to go through, and usually will respond. Other comments I’ll ignore if they’re not really making much of a point.. In other words, it’s subjective. I try to answer commenters when they’re asking a direct question, and I try to be as engaged as possible with my readers. Good stuff as always. I agree that you have to want to write and provide content on a consistent basis. There are lots of great stories about making money online and many opportunities for it, but plenty of sites that start up and close shop within a few months. You have to be in it for the long haul. One of the best things I did that helped was to build up a community and find friends in your niche. Having folks that you can bounce ideas and questions off of is priceless! I agree completely. Finding a network of other bloggers that you can work with and bounce ideas off of is priceless as well. Loved this series Pete! While I’m happy with how my site is growing now, the first 5 months I had very few readers. A few of these tips could have gone a long way to improve that! It is important to remember that making money with a blog takes time. I didn’t make back my hosting/domain fees until into my sixth month of blogging. I still don’t really pull in a lot of revenue and I will be a year old soon. If you are just in it for the money you probably won’t last long enough to make any. That is correct. Patience and stick-to-itiveness (is that a word?) are going to be important for the success of any blog. When you’re creating the right kind of content to make money, it will take time to build up an archive of articles, to figure out what types of articles pay well for adsense or affiliates, and to build up enough reputation so that people will link to you. Wow, that turned out to be quite the article – there is a lot of valuable information in those paragraphs above! glad you found it useful Bob! Thanks for putting this list of tips together. It’s very useful information for anyone starting out. If you treat your blog as a business you will focus more on the value you provide to your visitors than the cents you make when you first start. Oh this is such great stuff! I’m definitely going to be taking the advice and implementing it. Thanks for putting this all together. Great series. Some good advice here. I like the advice about treating it like a business and not a hobby, if you are serious about making money from the blog. Thanks Andy, glad you liked it. I agree, it’s important to treat your blog like a business if you want to succeed. Took me a while to read this but it was well worth it. Definitely going to bookmark this and read it every couple of weeks. Thanks for your research. Hey Pete – What a great list of honest advice from some well established names! Well done! It’s important to realize that for most bloggers, the income earned from their site is small relative to the income earned from a full-time job. Hence, don’t let making money from a blog be at the detriment to your real job! I’ll be coming out with a fun challenge tomorrow, and will link to this article either tomorrow, or during my next Katana wrap. Pete – great article! Really comprehensive and a wonderful way to show what established bloggers have done in order to be successful in their endeavors. Thanks for taking the time to contact each blogger and put this together. Really appreciate the effort here, Peter. The diversity of the group was refreshing. I’ve already bookmarked 6 other links to read just from this site! This series is proably the single most important piece(s) of advice I have received regarding trying to build my blog. I had previously thought that all of these things were heavily guarded secrets that no one was willing to talk about. Wow! This is some rich content and advice here. I’m sensing a pattern…it takes hard work, good content and patience! I do love the fact that just about everyone on the list says, “I didnt’ make any money at first” – it gives me hope that if I keep plugging away sooner or later something will “pop”! Thanks for putting this series together Pete! It does take time and perseverance to make a successful blog – along with some research and hard work. Good luck! I like your article on how to start a blog as i find myself in the same shoes. Your advise sounds great.Keep it up. Hope to keep reading your blog. I really like what I read/ learned from your postings. thanks a lot. Loving to be in such great company. Great way to finish off the series. Thanks Jeff! Thanks for giving us your input as well! Patrick´s last post ..Should You Borrow Money to Fund a Retirement Account? What an excellent compilation of thoughts on successful blogging—I’ll have this series bookmarked for a long time! Andrew @ Earn Give Save´s last post ..Live in a big city? Check out Groupon. You talk about experimenting with different AdSense sizes and shapes. There are exceptions, but on my blogs I find that text links are the best. Put a text link under the title of your article (post). Not too flashy. Just basic and relevant to the article. nooyawka212´s last post ..Can a homeowner’s insurance cover an auto stolen because keys were taken from break in to home? I wish I’d found this some time ago. This is great information to know and learn. I’ll be reading all the other stories with this one for some time. Clayton´s last post ..Come practice saving for Retirement with me!